Prime Minister Binyamin Netanyahu can't figure out who to support for President: Reuven Rivlin, David Levy or perhaps Dalia Itzik? Prime Minister Binyamin Netanyahu is reportedly in a bind over the presidential election. Hours after it was announced that Minister Silvan Shalom had decided not to run for the position of president because Netanyahu will not support his candidacy, Netanyahu has reportedly rejected another candidate: former foreign minister David Levy. The Hebrew language NRG news website reported on Wednesday evening that Netanyahu has been saying in closed conversations that he has no intention of asking Levy to run for president. Sources close to Netanyahu told the website that the prime minister has turned down the idea of supporting Levy because there is no political feasibility for his being elected. With both Shalom and Levy being out of the race, this leaves only MK Reuven Rivlin as the Likud’s candidate for the position. 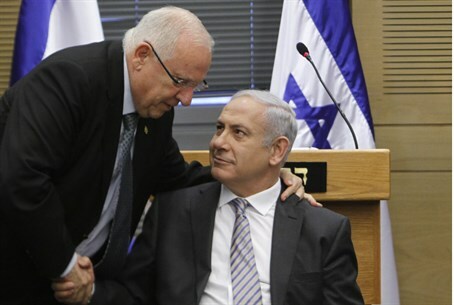 Netanyahu has been equally reluctant to support Rivlin as he was reluctant to support Shalom and, in fact, was making desperate maneuvers to try and prevent Rivlin from being elected. Netanyahu was trying to bring about a six-month postponement of the election, but failed to gain support for that from ministers and MKs. Likud MK Haim Katz, who supports Rivlin, has been trying to get Rivlin and Netanyahu to meet but so far has had little luck. Meanwhile, MK Meir Sheetrit (Hatnua) on Wednesday obtained the necessary ten signatures to run in presidential elections. "I call on all candidates to focus the public debate on one issue only - the most suitable candidate who has the power to unite all sections of the people," he stated, after obtaining the signatures. "After forty years of public activity as a mayor, as a legislator, as Minister of Finance, Minister of Justice, Minister of Housing, Minister of Interior, Minister of Education, Minister of Transport and a host of other public positions - I am convinced that I am a suitable candidate for president." He also said if he is chosen, he will focus on the "darker elements" of Israeli society. It is unknown as of yet whether Netanyahu will endorse Sheetrit, whose party is a member of his coalition. It is unlikely that Netanyahu will endorse MK Binyamin Ben-Eliezer (Labor), who is the opposition’s official candidate for the position. According to Hanan Crystal, a political analyst for Kol Yisrael radio, Netanyahu may endorse former Knesset Speaker Dalia Itzik for the position. Crystal said on Wednesday night that Itzik was waiting to find out whether she would have Netanyahu’s and Foreign Minister Avigdor Liberman’s support. Sources close to Liberman recently hinted that the foreign minister is leaning towards Itzik because of their good connections, and because he doesn't want to see the post taken by Rivlin.